Comet and Chaos "Yep we are ready, what do you want us to do?" 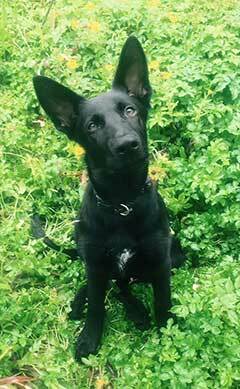 Carlo "You know what they say about big ears!" 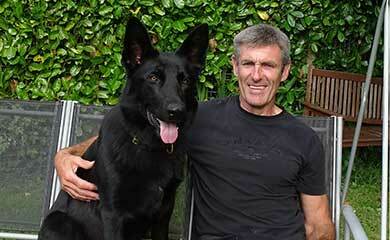 has also failed his hip x rays and so he cannot not take his place on the course either. I have never had 2 dogs fail their hip x rays on a course in 20 years of being involved in the puppy program. 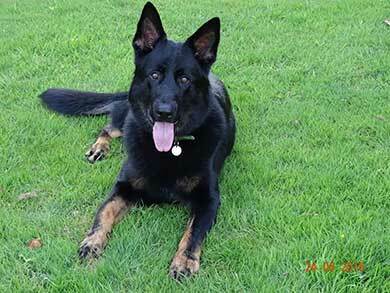 I had been very excited about going over to Germany to collect our new puppy Carlo last week but the news about Gizzy and Duke has left me thoroughly demoralised and feeling very despondent knowing how much effort and dedication had been put in by our puppy walkers Annie Miller and Lyn Parlour. Both dogs have been found excellent new homes and will no doubt have a wonderful life ahead of them but that doesn’t make it any less painful for the puppy walkers and in Gizzy’s case his handler Lee Adamson who had taken possession of Gizzy from Annie months ago to prepare for the course. 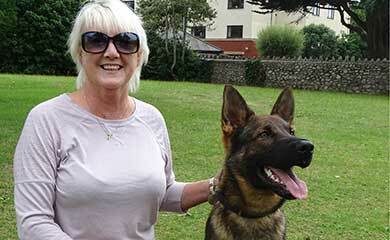 It was especially sad for Annie because she also puppy walked Lee’s first Police dog Vinny. 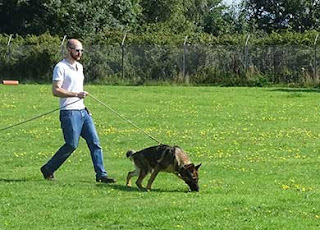 Finding replacement dogs for our handlers on the September 2015 Initial Police dog course was now the priority with time running out. 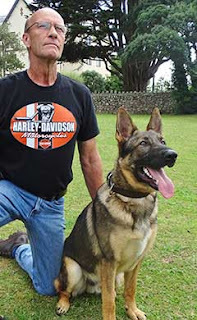 I contacted friends and contacts of mine in Germany to see if there was any possibility of any Potential Police dogs over there that might be available. 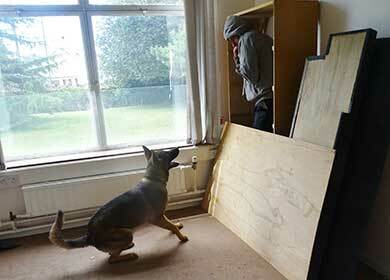 They very kindly advertised our plight and found several young dogs that they thought might be suitable. Unfortunately having assessed them I found that they didn’t have the necessary determination and enthusiasm that I needed and so I came away empty handed. 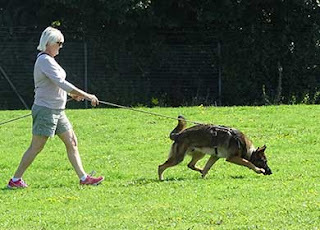 I did however come away with Carlo who I had purchased from a very well known breeder in Germany. I had seen he was available over 2 months ago and I had been attracted by his incredible family tree which had produced many very famous tracking dogs. He was the last remaining pup in the litter and so it was a big gamble on my part that he would be suitable. I had a contact in Belgium who had seen the litter and had purchased a puppy from the litter. He told me he thought that Carlo was a good puppy. I purchased him in the hope that he will bring his tracking genes to our puppy program in Devon and Cornwall. Unfortunately with the rabies rules a puppy cannot be brought over from the continent until they are 16 weeks old having had their rabies inoculation. Most breeders do not have the time to provide the socialisation that the pup needs in the critical period between 8 and 14 weeks so they come over already slightly handicapped in terms of their development. 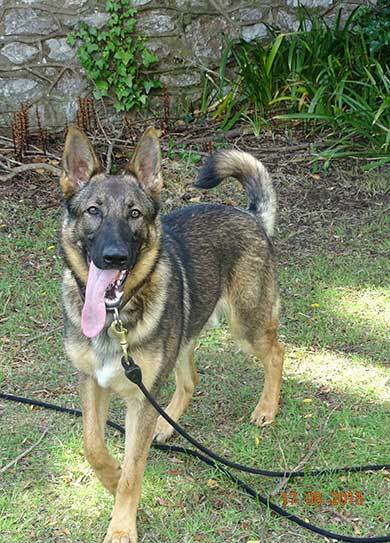 I remember last year when I imported Qwendi she needed at least 3 months to catch up the socialisation she had missed and that was only achieved because she had a strong character. I am hoping that with lots of extra socialisation work I can get Carlo to the best possible level of confidence with environmental situations that I can. 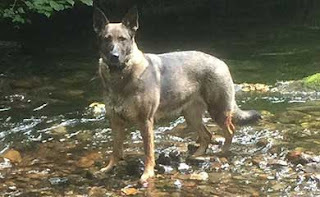 If I can get him to the level I would like I will then put him into the Devon and Cornwall Police program for allocation to a handler and hopefully make use of his excellent tracking genes by mating him to one of our girls Qwendi or Ruby. 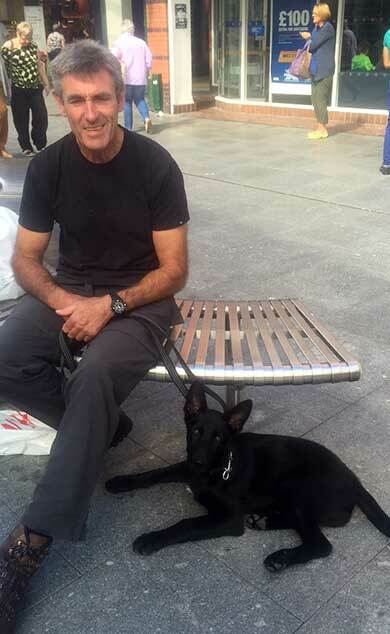 We arrived back on Friday last week and I have wasted no time in getting him out and about. 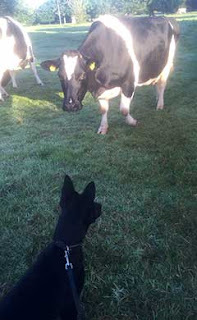 He is pictured here meeting the cows next to where I live. Then it was off to the city centre. He is a natural tracking dog. 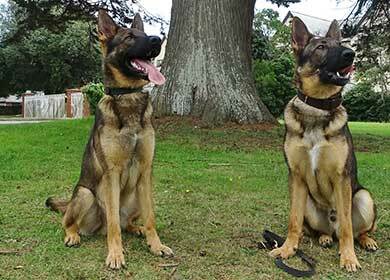 I must confess returning from Germany with no replacement dogs for Duke and Gizzy I was very disheartened. 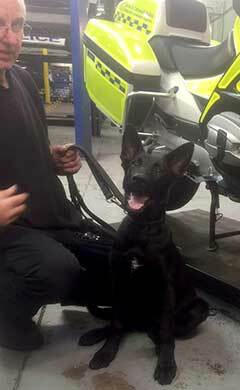 However my spirits were lifted when I was contacted during the week by handlers Mandy from Avon and Somerset, Mark Stevens and Lee Crampton with our A litter dogs Argo, Axel and Annie to tell me about excellent results they had just had which spurred me on. 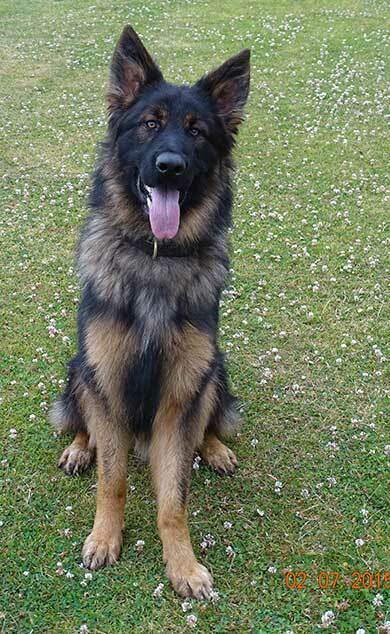 With no immediate replacements for Gizzy and Duke I held an emergency training assessment session on Monday this week with Chaos and Comet from our C litter. This was to see if they were at a level where they could be brought forward from January 2016 to the September 2015 course. 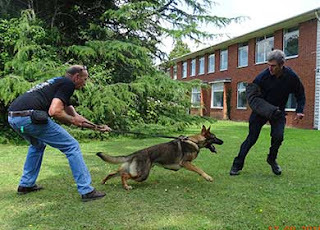 It is not ideal as they will only be 11 months old starting the course and whilst we will obviously keep agility exercises and impact work to a minimum they are still mentally immature. 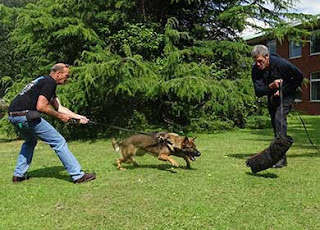 We did it successfully with Arry and Axel from our A litter but the handlers still have to manage them very carefully for their first 12 months of operational duty. I chose Chaos and Comet because they are more advanced than their siblings Charlie and Cosmic and both showed me that in terms of attitude, determination and enthusiasm they would have no difficulty doing the course. 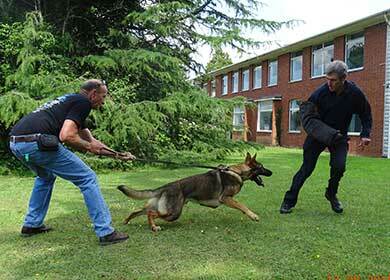 Here are a few pictures of them going through their exercises. Luke and Chaos showing their tracking skills. 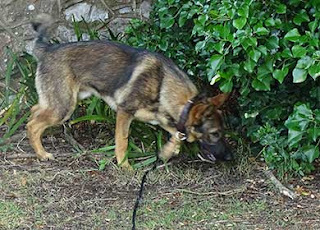 Chaos plays with his ball having tracked to it. Dawn showing Comet can track just as well as the best of them. Chaos searching for a hidden mobile phone. Chaos posing for the camera. Chaos getting down to serious business. Comet showing he is no slouch when it comes to the serious stuff. 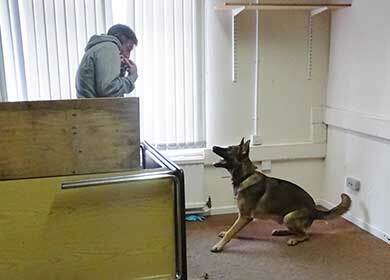 Comet barking at the strange looking man he has found. 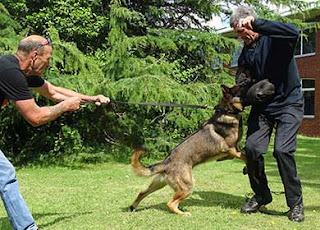 Chaos shows he can be just as scary as Comet. What are we doing next we are still full of energy (Comet and Chaos are thinking below). 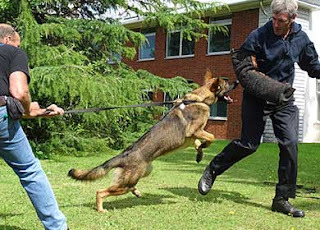 Finally my bad lucked continued when Ruby came in season and we tried for a mating with Police dog Logan. Unfortunately Logan’s inexperience didn’t impress Ruby and she decided she had waited around long enough before she sent him packing. Here is Ruby taking a dip in the river after their unsuccessful encounter. 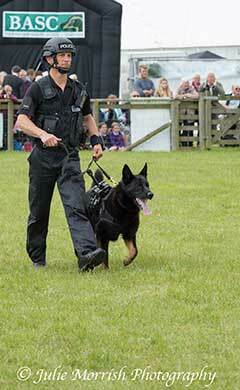 I must confess I felt sympathy for Logan’s handler Steve who looked disappointed in Logan’s performance. I tried to soften the blow to masculine pride by my sympathetic comment ‘Steve, it can happen to the most masculine of males’ but I don’t think Steve was soothed by my attempt to boost his ego. So here is a picture of Steve and Logan at the Devon county show looking very masculine indeed. 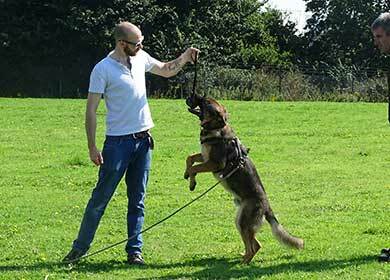 As I write this Blog I am still searching and contacting everyone that I know to try and acquire 2 adult dogs for the September course to save having to use Comet and Chaos. In my next blog I will update you about how successful I have been and there will be an update on how Billy, Flynn, Memphis, Rika and new addition Carlo get on in their training session and a visit to the city centre.